If you aren't a poet how do you capture the majesty of a leaf getting caught in the breeze or attempt to delve deep into the psych and hear the sound of one hand clapping. 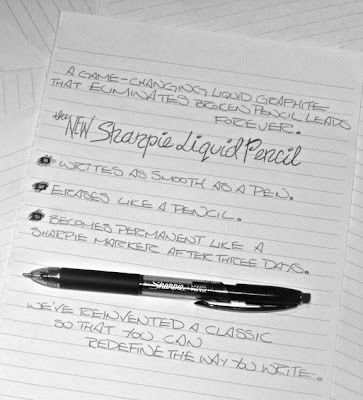 This is the conundrum which I was caught up in when I first heard the news about Sharpie's Liquid Pencil. My mind was literally blown. I couldn't comprehend this game changing experience and I certainly couldn't blog about something this monumental with out some kind of equally mind blowing words. Unfortunately, now that the weekend has passed I know I can't attempt to equal the grandeur and euphoria I felt when I heard about this new device so my usual string of ramblings will have to do. Just last Tuesday I was attempting to put together a small sketch for a co-worker, but all I had was pens and I did my best, but my best wasn't good enough with just a pen. 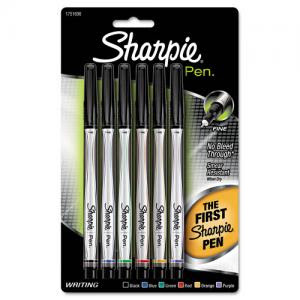 I am a fan of the Sharpie Pens (just not the retractable ones) and generally a fan of a strong bold line in general. I'm not a designer by trade, but I know what I like. On Wednesday I asked around and everybody had pens. Nobody had an extra pencil to give up, but everybody had bags of cheap pens to throw around. Eventually I found one lonely unused pencil that found a new home in my cup amongst my highlighters, my boring ball points, and my Sharpie Pens. 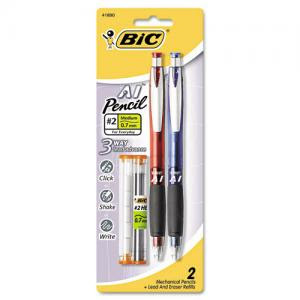 One Red BIC AI Mechanical Pencil is all we had. No box, no extra lead, no matching blue pencil were anywhere to be seen. It's a nice enough pencil. It has some good weight, and the 0.7mm lead is a good width, but there is no way that a piece of #2 lead can compare with a solid ink line. On Thursday I stumbled across a link to the Sharpie Blog that had on display the graphic (as seen above) spouting the wonder that is the Sharpie Liquid Pencil. I immediately told our designer and we sat staring at the graphic with our mouths open in disbelief. I called our marketing person and our supplier contact and told both of them to get me a Liquid Pencil as soon as they could. Some people are reporting they were actually able to purchase them and I'm still able to type this, so I guess Liquid Graphite was not a precursor to the event horizon.